Anthony Joshua (22-0, 20 KOs) successfully defended his heavyweight titles on Saturday night, with a stoppage win over Alexander Povetkin (34-2, 24 KOs) at Wembley Stadium in London, England. It was not without headaches, however, as Povetkin stunned Joshua on more than one occasion and bloodied his nose with an uppercut early on in the fight, including a right hook during the third that wobbled Joshua. After some initial success from Povetkin, Joshua looked tentative as he looked weary of Povetkin’s left hooks. 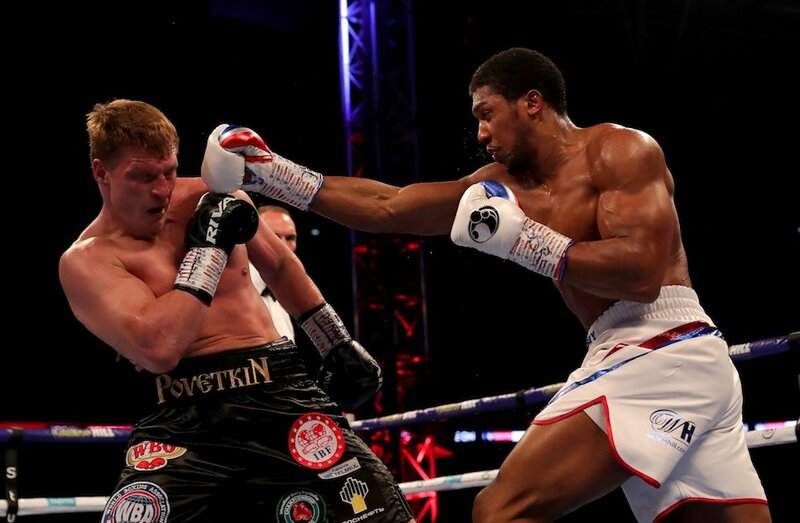 However, Joshua began to adjust by the fourth round and a right hand caused a cut over Povetkin’s left eye. In the seventh, a left-right combination from Joshua sent Povetkin down to the canvas. Povetkin slowly made it to his feet but Joshua followed-up with a series of blows that prompted the referee to waive it off. After the fight, Joshua talked about his next fight, which is already penciled in for Wembley Stadium on April 13. That fight could be against the winner of the recently announced title showdown between Deontay Wilder and Tyson Fury. While not showing any preference initially, Joshua finally relented and said he’d like to fight Wilder, which is the unification bout fans have been clamoring for.